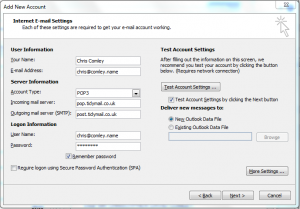 Here’s how to set up Microsoft Outlook 2010 for Tidymail. Earlier or later versions of Outlook may have some of these screens and menus in a different order but the settings are the same. Note that you can click on each of the screenshots in this document to view a full size version of the dialogue box. Note that you can also create the new account in the “Email” section of the Windows “Control Panel” – however the dialog boxes you meet there are the same, so this page concentrates on how to do it via Outlook itself. Start outlook, click on “File”, and then click on the Add Account button. If you already have any accounts they will be listed on this page. In the new window, IGNORE the options to fill in your details at first. Outlook will use these details to guess what sort of account you have but it will get it wrong, so instead, click the radio button next to “Manually configure server settings or additional server types“, and click Next. On the next screen, choose “Internet E-Mail” and click Next. Here is the dialogue you are presented with, filled in with a user config. It’s important to note that your “user name” is your FULL email address, e.g. fred.bloggs@wombats.com – Outlook will assume only part of your email address is your username so you will have to over-ride what it puts in. If you don’t want Outlook to remember your password, but to prompt you for it each time it checks for mail, un-tick the Remember Password box. DO NOT CLICK ‘NEXT’ yet… first click “More Settings”. In the “More Settings” dialog box you need to make two important changes before your account will work. First of all, in the “Outgoing Server” tab, you need to turn on “Authentication”. Tick the top box “My server requires Authentication”. Usually, it will be sufficient to accept the default option of “User same settings as my incoming mail server”. 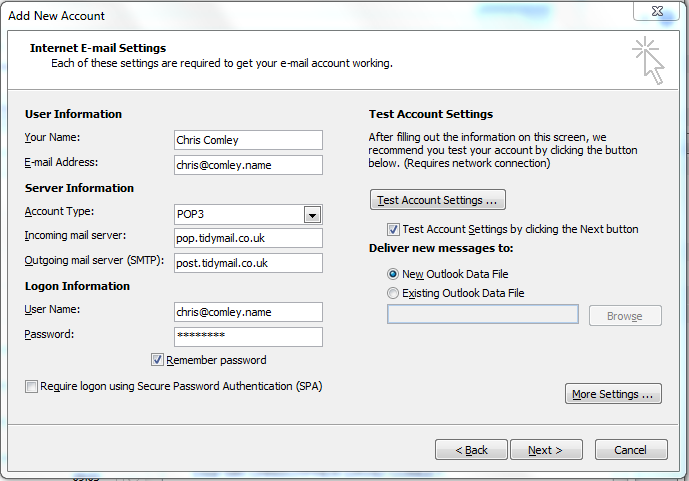 If you wish to use Outlook to send mail from an account other than your Tidymail account, but sent it via our servers, then you will need to choose the second choice here and fill in your Tidymail username (remember, it’s your complete email address) and password underneath. Advanced Settings. There are a couple of changes to make. First up, change the “Port Number” for the “Incoming Server (POP3):” to 995 and tick the box “This server requires an encrypted connection (SSL)”. 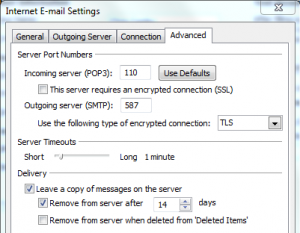 Then change the port number for “Outgoing (SMTP) server” from 25 to 587. Encryption. Just under the port number, you can see from the screenshot on the left that I have changed the Encryption Type from None to TLS. Using this means that your email between Outlook and our server is encrypted, and can’t be “sniffed”. With TLS turned on, the most anyone can tell from your email is who it was to. If the dropdown does not include “TLS” then make the port number “465” and set the type for the encrypted connection to “SSL”. Delivery settings. 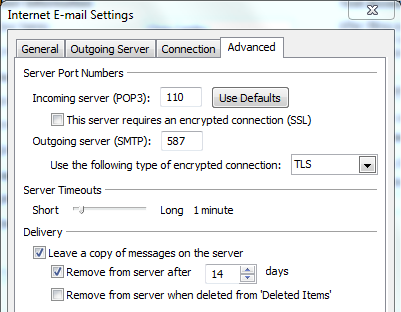 Normally POP clients remove the mail from the server as soon as it’s been received by the client. We suggest changing it so that it’s left on the server for a few days (here it’s set to 14) – this way the mail items will still be visible to the Tidymail webmail interface for two weeks. Now “OK” the More Settings changes and you’ll return to the main page. You can click the “Test Account Settings” button – this will send a test message to yourself using the newly created account details. Any errors that pop up mean you need to check your entries. Once you’re happy the entries are all correct and the account is working, click “Next>” – Outlook will test the settings again then save the new account details.